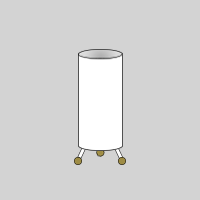 Design your own unique floor lamps and enjoy the soft, warming glow against the shapes of your pattern. This original piece of home decor is the focal point of the room during daylight, and then illuminates the rest of the room during the evening. Made from semi-translucent fabric with stylish tripod feet made out of beechwood, these custom lamps come in 2 sizes for the table or floor. These beautifully handmade decorative floor lamps or table lamps are a lovely addition to your home, and cast the room with a soft, warming glow. Your designs are printed onto a slightly textured semi-translucent fabric, so the patterns are visible when the light is on and off. The beechwood feet are set into a tripod position so it's stable on your floor or table. Choose from either a UK plug (bulb holder for B22 Bayonet cap) or EU plug (bulb holder for E27 Edison screw). Your lamp will come with a removable adaptor to alter the size of the fitting ring. Choose from decorative floor lamps or a chic standing lamp for the table. Our specialist printing process fuses the ink with the Stiff Translucent fabric so your design is long-lasting and won't rub off. A fire retardant inner lining is sewn to the interior, giving your custom lamps that added bit of safety. Cylindrical in shape, the light is able to escape from the top and bottom, producing a lovely, soft glow. A 1.8m long cord is attached, with the UK or EU plug. The feet are made from classic beechwood, and set into a tripod position. Maintain cleanliness and keep your designs nice and vibrant by giving your unique floor lamps a regular dusting. As with any electrical appliance, keep water away from the plug socket and bulb at all times. 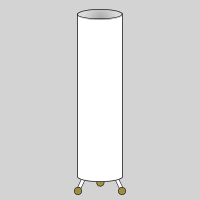 Due to your custom lamps being vertical and cylindrical, not all images are suitable to print. We suggest a repeat pattern, or if using photos, create a montage or manually scale them down and position. Within the design interface you can adjust and edit your images to get the perfect result. Please note that your designs are visible through the semi-translucent fabric when the lamp is on and off. This creates a stunning effect where it appears like your designs are dancing in the glowing light. Print excellent The cylinder table lamp has excellent printing and looks lovely lit or unlit. good packaging and arrived safely. Printing great The cylinder lamp and glass chopping board both look great with the printing being really excellent on both products. Goods arrived well packaged too. Go for an unusual feature piece for the living room and design decorative floor lamps. They're modern, contemporary and totally cool, and the simplistic shape will never go out of fashion. You can design them for the children's bedrooms as a fun night light, decorated with friendly patterns to help them get to sleep. Enhance hotel rooms with these unique floor lamps. You can print complementary colours to the room's theme, or include your branding for an extra touch of professionalism. You can also elevate event spaces that need a little more oomph and use them as a way to draw people to your stand or exhibition. Add a new product to your home furnishing portfolio and create a new line of custom lamps. Printed with your own artwork, this is a novel way to allow customers to enjoy your art and display it decoratively in their homes. They're exceptionally handmade and as they come with UK or EU plugs, you can reach a wider audience. What is the maximum wattage? The large floor lamps have a maximum wattage of 60w bulb, whereas the small custom lamps have a maximum wattage of 40w bulb. However we recommend using energy saving bulbs. The cord we supply is 1.8m, so you've got plenty of wire to play with should your plug sockets be further away from where you actually want your decorative floor lamps to be. What plugs come with it? You have a choice of 2 plugs, either UK plug fitting (bulb holder for B22 Bayonet cap) or EU plug fitting (bulb holder for E27 Edison screw). Please make sure to select the right plug. Add artistic flair to your room with these decorative floor lamps designed by our #ContradoCreatives. They're printed all over with original artwork, and are the perfect addition to your home interior.